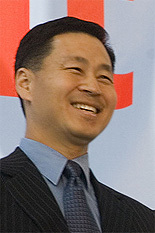 Washingtonian magazine and the Greater Washington Board of Trade have named Jeong H. Kim, Clark School benefactor, alumnus and professor of practice in electrical and computer engineering, to the Washington Business Hall of Fame for 2006. Kim, Ph.D. ’91, reliability engineering, is being honored for his business savvy in establishing telecomm company Yurie Systems and for his leadership at Lucent’s Bell Labs. He is one of five honorees this year. A. James Clark, for whom the Clark School is named, is also a member of the hall. The Washington Business Hall of Fame was founded in 1988 by the Greater Washington Board of Trade and Washingtonian. The 2006 honorees will be inducted on November 28.